For students, artists, kids, or crafters this simple no-sew pencil holder is the perfect DIY project--or gift! 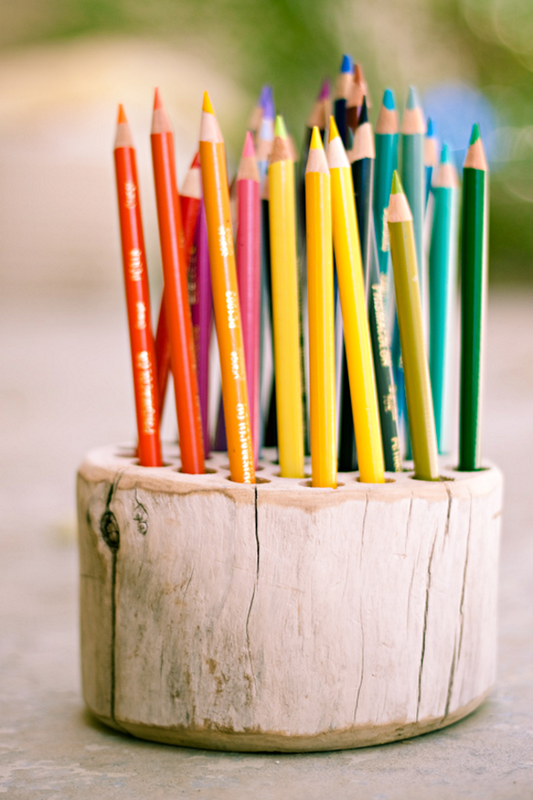 DIY Idea: Make a Whimsical Wood Pencil Holder! Whether you've got some branches left over from making a few tree limb coasters or you're just looking to add a few rustic embellishments to your abode, this whimsical pencil holder is just the DIY project you need! Secondhand Chic: Turning a Backgammon Game into the Most Awesome Pencil Box Ever. Join the colored pencil of the month club. You know how some images make your heart leap with joy? This could be one them. A fence that looks like an orderly row of Crayola Pencils. Could it get any better? And the best part is it’s totally DIYable. All you’d need is some wooden fence posts. Then, whittle down the tops of each and have fun painting! Image courtesy of Saima on flickr.